I signed Lesia’s 5th form class up for a really cool art exchange program with One World Classrooms and the experience has been great. It was even free to participate as a Peace Corps volunteer in Ukraine. The program connects classrooms from all over the world by gathering and sending out collections of K-12 student traditional artwork. 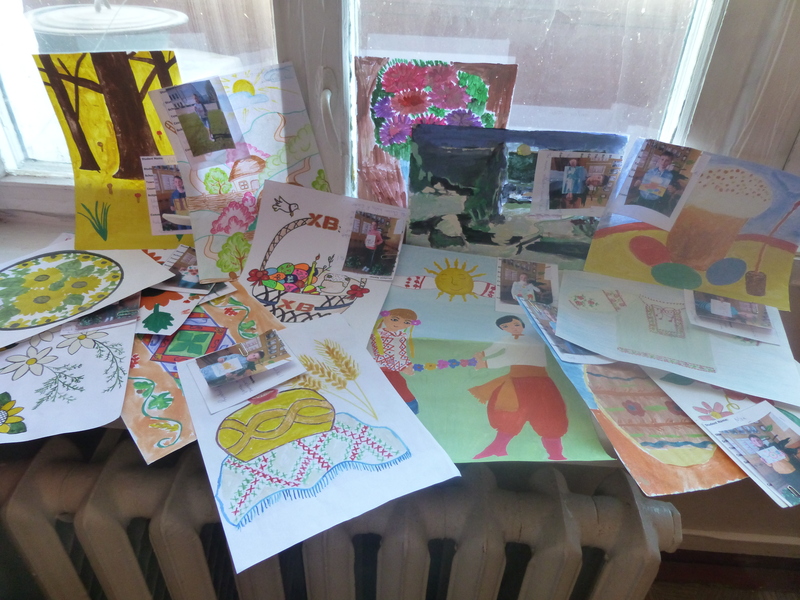 So for example, 25 of my students each drew a traditional picture of Ukraine. We took photos of each student with their piece of art, wrote a description in both English and Ukrainian and then attached it to the picture. We then sent them all into the One World Classroom headquarters. In a few months we will receive 25 pictures form throughout the world along with a picture of each student who drew it and a description in English and their native language. A sample of our 25 pieces, ready to be shipped out around the world. I love this program because it gives my students a chance to proudly share their culture and use their English as a truly global language. When receiving artwork and English messages from children their own age in China, Africa, Mongolia and South America, how can they deny the potential their languages classes can provide them? We are scheduled to receive our global collection in June.